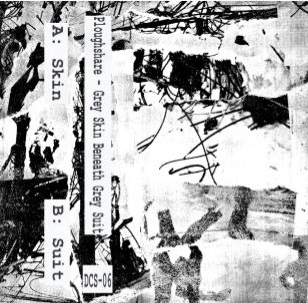 Grimy harsh noise and feedback worship from this notorious Italian master. Edition of 60. Professionally printed artwork and dubbed onto type II chrome cassettes. Includes insert. Second album of lo-fi noise from Edward Giles aka E.J. Vodka of legendary NYC power electronics act Final Solution. Edition of 54. Professionally printed artwork and dubbed onto type II chrome cassettes. Includes pin. Tracks repeat on both sides. Blown out scrap metal worship. The soundtrack to covert military experiments and close encounters. Edition of 60. Professionally printed artwork and dubbed onto type II chrome cassettes. Fecalove and Ploughshare tapes are $7. 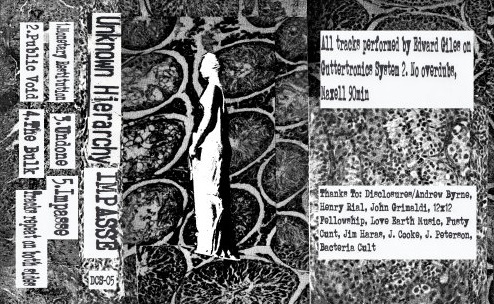 Unknown Hierarchy is $8. Shipping prices are available on the store or contact me directly at mbdcontact160@gmail.com. All orders ship the week of 03/05/2018. All artwork printed by Fairfield Press. Torn Light Records, Skeleton Dust Records and Dead Gods are handling U.S. distribution, Scream And Writhe is handling Canadian distribution and Tordon Ljud is handling European distribution.